Actor Mohit Marwah is now a married man. The Raag Desh actor married his longtime girlfriend Antara Motiwala on Tuesday in a lavish ceremony hosted in Waldorf Astoria Ras Al Khaimah in UAE. Sridevi was one of the first in the Kapoor family to introduce 'Antara Marwah' to the world. 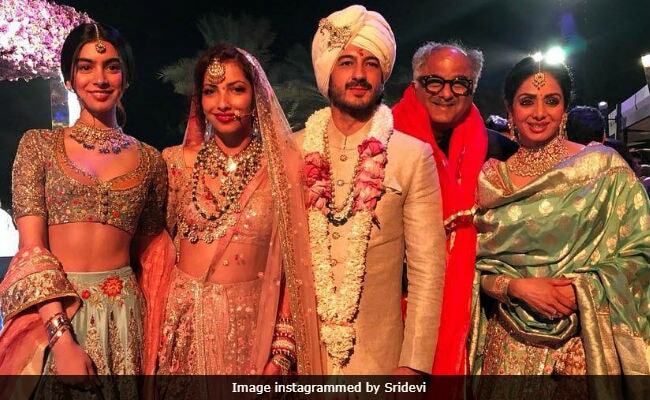 In the picture Sridevi instagrammed, Antara and Mohit posed with her, Boney Kapoor and Khushi. Antara looked pretty in a pastel shade embellished lehenga festooned with kundan, emerald and pearl jewellery. Mohit looked dashing in an ivory sherwani. Sridevi wore a beautiful green embellished lehenga with banarasi dupatta. Khushi looked gorgeous too. Sridevi's elder daughter Janhvi skipped the wedding festivities probably because of her work-in-progress film Dhadak.